With the beauty world already full with so many BB Creams from Asian and Western brands, now they put another BOMB to us. 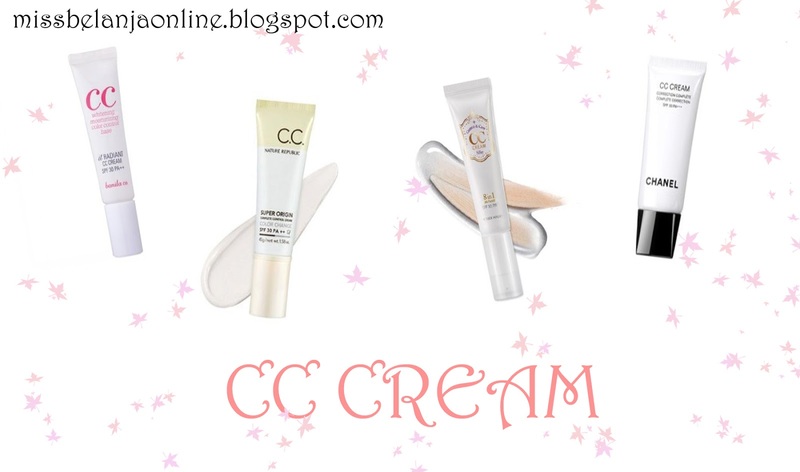 I believe many of you already heard about the latest innovation of BB Cream called CC Cream. I've already mentioned about this magic cream before, but now I will talk again about this famous cream. First, let's talk about BB Cream. BB Cream stands for Blemish Balm Cream (this is the most common name. They had another name like blemish base, beauty balm, or beblesh balm,etc). BB Cream mostly known as a "good foundation". It has functions like foundation but with more benefit. It works as a base and also offers a sheer-medium coverage. The advantages are, it also offers sun protection and another benefits like anti-wrinkle, whitening, and suitable for people with trouble skin / acne-prone skin. While foundation usually tends to be heavy, BB Creams are more lighter and suitable for daily used. I always love BB Cream ever since I knew it for the first time. Can't really remember when, but I think it's around 2008 or 2009. I choose BB Cream over foundation because of its light texture and it also suitable for acne-prone skin. My skin tends to break out when I used foundation. And now the latest issue~ CC Cream. With the claims that CC Cream will works better than BB Cream, I think this cream will be famous in a short time. The problem with BB Creams is, it tends to be too light after some time. It also only offers 1 or 2 shades and mostly only suitable for fair skin tone. CC Cream claims to be more "fit on skin tone" than BB Cream because the color can change (for some brands). But I must admit that CC Cream is quite interesting product, whether it changed the color or not. lol. And now the latest issue~ CC Cream. With the claims that CC Cream will works better than BB Cream, I think this cream will be famous in a short time. The problem with BB Creams is, it tends to be too light after some time. Aku pernah nyoba sample toymoly pure aura cc cream. cc cream ini gak bikin breakout di aku.. Konon kabarnya karena banyakan kandungan skincare klo di cc cream. Cuma ya itu.. sheer coverage, blemishes masih terpampang dengan jelas dimuka. Bener2 brasa ga pake apa2 dimuka, cuma rada putihan aja kelar pakenya..